Just in time for doomsday, Norway’s “Doomsday Vault” is getting an expansion. Officially known as the World Arctic Archive, the vault opened this week and has already taken submissions from two countries. This time, instead of storing seeds that will survive the apocalypse, the vault is archiving data using specially developed film. Located about 620 miles from the North Pole in Svalbard, Norway, the World Arctic Archive has been built in “Mine 3,” an abandoned coal mine close to the Global Seed Vault. Countries are being encouraged to submit data that is particularly significant to their culture. According to documents from Piql, a country can upload test, images or audio-visual content to Piql’s servers. That data is then transferred to the special film that is designed to withstand significant wear and tear. It’s then placed into a secure box and housed inside the heavily fortified vault. As long as the internet and servers are still functioning, the data will remain searchable online. Upon request, it can be delivered digitally or shipped on a physical format of the users choice. Analog storage is generally considered more future proof than digital. No special codecs or updates or operating systems would be necessary to decipher the information in the event that the planet suffers some sort of catastrophic reset. But even in the short-term, this could be useful for storing precious data that a government might need but only trusts in the most secure of locations. 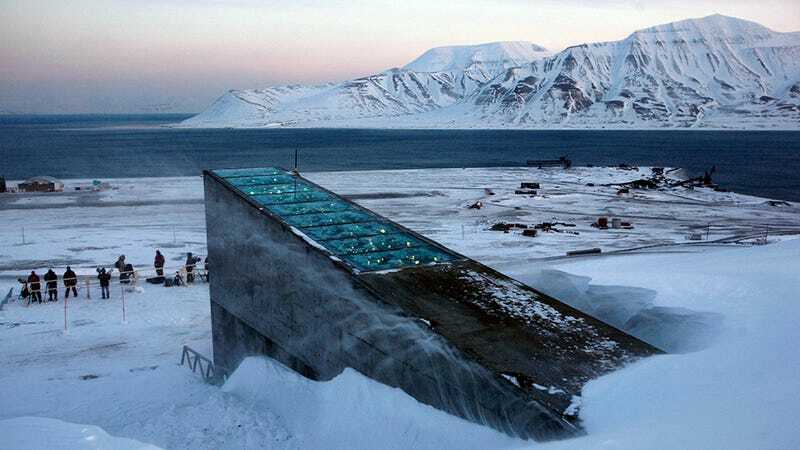 In 2015, the first withdrawal of seeds from the Global Seed Vault occurred. Samples of wheat, barley, and grasses were sent to replace seeds in a gene bank in Aleppo that was damaged in the ongoing Syrian Civil war. It’s not inconceivable that a government might have to replace some lost data in the near future. Thus far, Mexico and Brazil are the only countries that have submitted to the project. Officials from Piql tell Live Science that Brazil has submitted historical documents like the Brazilian Constitution and Mexico has submitted important documents that date all the way back to Inca period. Hopefully, the extreme and multi-faceted destabilization that the world is facing today doesn’t end in some sort of full-on mass catastrophe. But if it does, the AI overlords that rise in its wake will hopefully have access to some of the most important aspects of culture that humans left behind.